A true treasure of spiritual insights, this little booklet contains the remarkable meditations on the Agony of Jesus in the Garden of Gethsemane by Blessed Padre Pio, the stigmatist priest. One of his few writings, the booklet also includes many pictures of Blessed Padre Pio from throughout his ministry. Padre Pio's beautiful and descriptive manner of writing provide a wonderful spiritual insight into that last night of Jesus\' human life. 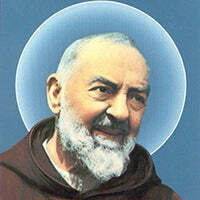 St. Padre Pio was a friar, priest, stigmatist, and mystic, now venerated as a saint of the Catholic Church. Born Francesco Forgione, he was given the name of Pius (Italian: Pio) when he joined the Order of Friars Minor Capuchin. Padre Pio became famous for exhibiting stigmata for most of his life, thereby generating much interest and controversy. He was both beatified (1999) and canonized (2002) by Pope John Paul II.